Sniff, snuffle, cough... time for tea! Whether you're fighting off a pesky bug or just want to keep your immune system in tip-top shape, these teas contain soothing herbals which are traditional remedies for keeping your body strong. 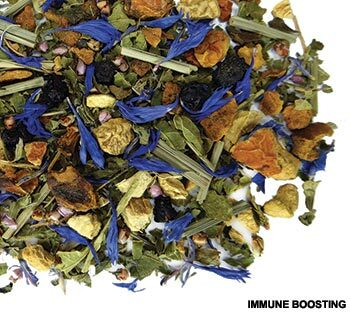 The warming ginger in Blueberry Ginger and Tulsi Chai contains antibacterial and digestive properties, while lemongrass in Detox Wellness is a popular remedy for boosting the immunity and promoting sleep. Plus research indicates that the antioxidants in all tea may help strengthen the immune system and ease cold and flu symptoms!